Pictured from left to right: Chris Clement|! !| vice president of finance and administration|! !| UNH; Professor Chris LeBlanc; Mayor Joyce Craig; UNH Manchester Dean Mike Decelle; Professor Robert Arredondo; Professor Sean Tavares; and David Smith|! !| vice president and general manager of Burndy|! !| LLC. 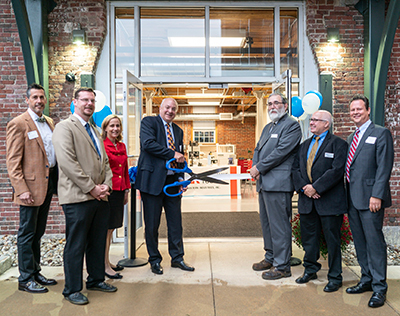 More than 60 people gathered at the University of New Hampshire at Manchester on Wednesday, Oct. 10 to celebrate the grand opening of its new Engineering Technology Machine Shop. Students, alumni, faculty and staff joined politicians, business leaders and industry partners to recognize what Manchester Mayor Joyce Craig called “an important milestone” in the college’s commitment to workforce development. 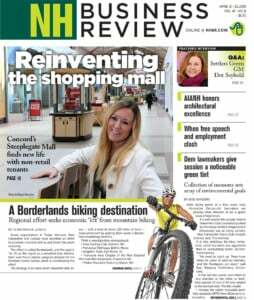 Of the 90 percent of UNH engineering technology graduates who were employed in the field upon graduation, 94 percent work and live in New Hampshire, according to a survey of UNH’s 2017 class by the National Association of Colleges and Employers. The survey also showed that engineering technology grads averaged a $71,923 starting salary—36 percent higher than the average starting salary for all 2017 graduates. Equipped with vertical and horizontal milling machines, a computer numerical controlled milling machine, a lathe, various saws and a disc sander, UNH Manchester’s new Engineering Technology Machine Shop provides students with experiential learning opportunities in mechanical fabrication and testing. Sean Tavares, assistant professor of engineering technology, said new lab will further their students’ employability in manufacturing roles, which are in especially high demand. UNH Manchester’s two-year electrical engineering technology and mechanical engineering technology programs offer bachelor’s degree completion for students who hold a related associate degree. A majority of electrical engineering students come to UNH Manchester from a New Hampshire community college. LeBlanc said the new machine shop allows students to put theoretical concepts into action. Decelle thanked the Community College System of New Hampshire and Burndy for donating equipment to the machine shop, and the Hubbell Foundation for creating the Hubbell Construction and Energy Engineering Scholarship Fund to support underrepresented students in the engineering technology program. He said the college will continue to advance the program and expand its partnerships with industry.